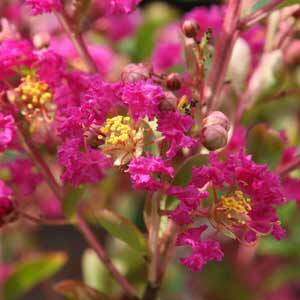 Wholesale Crepe Myrtle or Lagerstroemia cultivars are offered by wholesale nurseries in a range of sizes from small potted plants through to semi advanced and advanced specimens ready for instant impact in any landscaping project. Crepe Myrtle trees grow well in Adelaide, Melbourne, Sydney, Brisbane and Perth. Usually cultivars of Lagerstroemia faurei or Lagerstroemia indica, both are deciduous trees and both are exotics (not native to Australia). A number of varieties are available, mainly identified by growth habit and flower colour. Dwarf varieties that will reach around 1 m in height as well as larger trees that will reach to 5m are all offered. The choice of growth form, either as a bush or a tree opens up landscaping possibilities. Also available as weeping types. Flower colours vary from white through to pinks and reds. Soil – Humus rich moist but well drained. Flower colours – White, Pink and Red with variations. Height – 1m to 10m depending on the cultivar. Final height will depend on soil conditions as well as variety. Wholesale Crepe Myrtle are available from the following growers.